Partitions in wood and glass. The best way to combine the aesthetics of glass and the availability of wooden material. in photo from the left entrance with sliding glass doors, side wall with melamine panels in matching with the desk. The wall also allows the insertion of shelves in special hooks. In the room on the right the hanging loads increase with the presence of small library modules placed at the right height for a comfortable use. Meeting room with monolithic glass panels, white frames. Glass is a symbol of communication and openness suitable for meeting and conference rooms and has been fitted with a full-height wooden door in combination with the table. Wood and glass partitions with serigraphy. Partitions become communication tools more than division. Administrative room on the left hidden by wooden dividing walls, creative room on the right with glass walls. Both partitions have been decorated with customizable films in texts, shapes, drawings and images. La trasparenza del vetro la sicurezza del "muro". Proximity studies show that the natural tendency of human beings to enter a room and to dispose naturally along the edge where they have their backs covered and can easily observe the surroundings. Put the operators in these rooms at ease improves their quality. working and offers the possibility of archiving on blind panels. When you have something beautiful, the pleasure is in showing it. The glass parts allow you to observe even in the field along the beauty of wood veneer furniture coordinated with the interior walls. Imagine replacing the glass walls with walls, you would find yourself observing a very different environment. Type of classic structure, also suitable for public areas or in any case of high transit. Realization with lichen wall covering. We took advantage of the glass walls to reveal a beautiful Scandinavian lichen wall covering in the adjoining room. 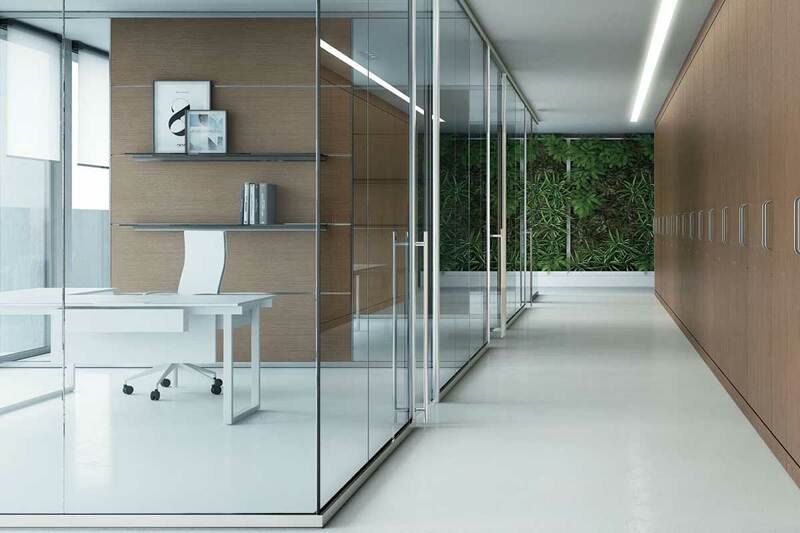 If the mix appeal between glass and wooden panels is not conclusive, you can find other ideas on glass walls section. Glass walls with frame, opaque panels on the left, transparent on the right. Different solutions in one layout. The walls with these construction features can carry wiring, altought limited to the inside of the tracks, they also guarantee greater solidity and resistance to loads.